A work of art is more than an object to view; it is a record of an artist’s thoughts, emotions and intentions captured over time. Sitting before a piece of art allows a viewer to absorb the artist’s process—the planning, the sequence, the texture, the brush strokes. For the artist, a learner by nature, sitting with and studying masterful work is essential. But in a country as young as the United States, opportunities to immerse oneself in classical portraiture are not as plentiful as in older countries. There is a vast repository of work overseas and in U.S. cultural epicenters like New York, Washington, D.C., and Los Angeles. However, short of jumping on a plane for a national or international art tour, how can the aspiring artist manage to study masterful pieces on a regular basis? Surprisingly, treasures can be found within driving distance! No matter where we live in the U.S. or abroad, we are sure to discover masterworks with a bit of research and through word-of-mouth. Above, left: Portrait of a Gentleman Holding a Pair of Gloves by Jacobus Leveck (Dordrecht 1634 – 1675 Amsterdam). Oil on panel, 35 x 27.6 in. Private collection, by courtesy of the Hoogsteder Museum Foundation, The Hague. Above, right: Old Woman with a Staff by Abraham van Dijck (Amsterdam 1635/36 – 1680 Dordrecht). Oil on panel, 28 x 21.7 in. Private collection, by courtesy of the Hoogsteder Museum Foundation, The Hague. A recent drive from Atlanta to the charming town of Lakeland in Central Florida led to the discovery of Rembrandt’s Academy. The Polk Museum of Art at Florida Southern College, the Smithsonian Institution-affiliated museum which featured the exhibit, was an absolute jewel to find in a town with a population of only around 100,000. And visiting Dutch works of the 1600s so close to home was a rare opportunity. The exhibition, organized by the Hoogsteder Museum Foundation of The Hague in The Netherlands, featured works of the students of Rembrandt Harmensz. van Rijn. 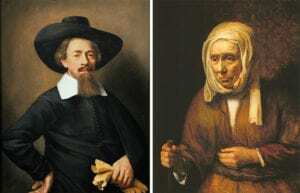 Rembrandt (1606-1669) trained nearly 40 artists to create masterworks in his style at the Academy. This proliferation of work, paired with his own innovation and brilliance, explain why he is so widely known and revered as a master. While working and studying at the Academy, Rembrandt’s students trained in his methods and even assisted with commissions – painting backgrounds, costumes, and drapery. Many of the Academy artists continued to paint in the Rembrandtesquemanner after his death, and several even went on to achieve recognition and success themselves. Above, left: Two Girls with a Bird’s Nest by Jacob Backer (Harlingen 1608/09 – 1651 Amsterdam). Oil on panel, 38.2 x 33.1 in. Private collection, by courtesy of the Hoogsteder Museum Foundation, The Hague. 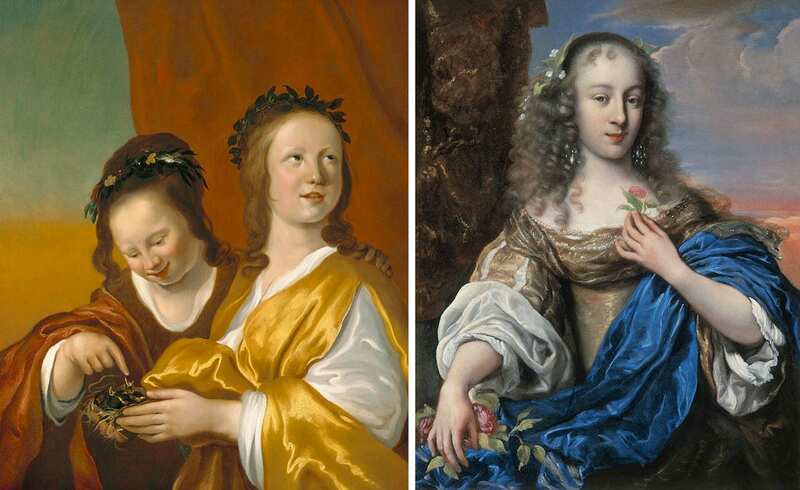 Above, right: Portrait of a Lady as Flora, possibly Lucia Wijbrandt by Jurgen Ovens (Tonning 1623 – 1678 Friedrichstadt). Oil on canvas, 33.5 x 26 in. Private collection, by courtesy of the Hoogsteder Museum Foundation, The Hague. The Origins of the Academy (1619-1630). During this time, Rembrandt polished his skills under the tutelage of his own teachers, eventually taking on his first pupils around 1627. Once established, dozens of artists enrolled at his new Academy. He trained them in his unique style – an amalgam of influences from sixteenth century printmakers, Italian Renaissance artists, and followers of Caravaggio. 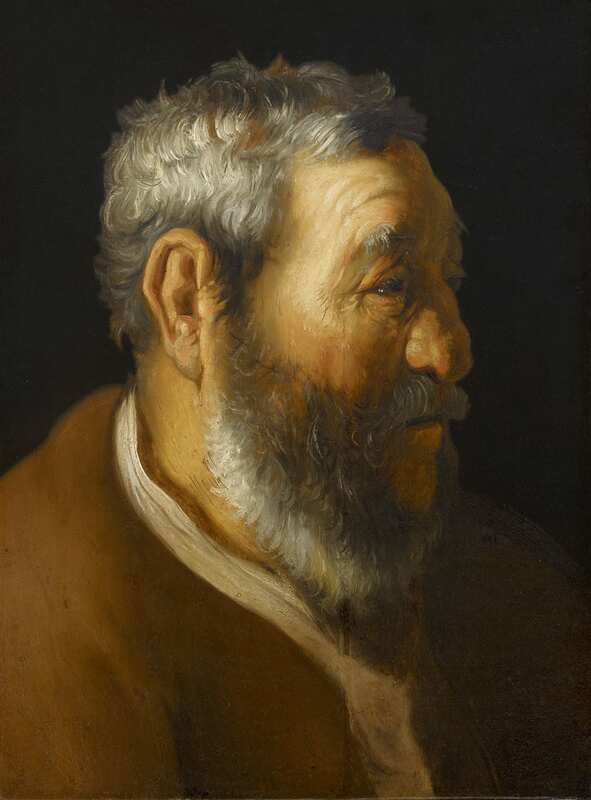 Rembrandt’s manner can be seen in the rich chiaroscuro, earthy palette, and detailed handling of the subject by his colleague, Jan Lievens. The Heyday of the Academy (1631-1655). As Rembrandt gained more success and fame, he moved the Academy to Amsterdam. Several students followed, and the studio became more commercially focused, producing a great deal of work for wealthy patrons. Rembrandt had become a brand. Rembrandt’s use of lights and darks and honest portrayal of subjects is evident in the works of students, Jacobus Leveck and Abraham van Dijck. Above: Portrait of Rembrandt by Daniel Koninck (Amsterdam 1668 – after 1720 England). Oil on canvas, 32.9 x 27.4 in. Signed upper right DKoninck. Private collection, by courtesy of the Hoogsteder Museum Foundation, The Hague. Rebelling Against the Academy (after 1650). Fashions changed. The trends became brighter and more elegant. Rubens and van Dyck were in the spotlight. 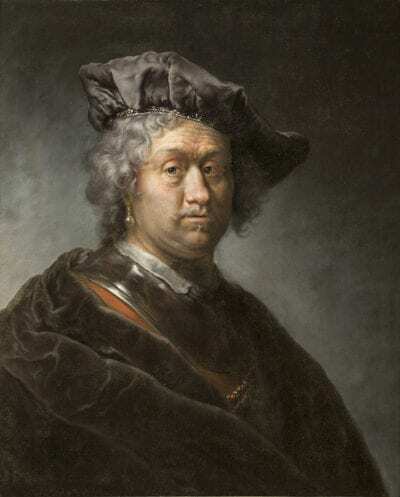 Many of the artists who had studied under Rembrandt adapted to the changing palettes and trends; however, the master himself rebelled and became increasingly isolated. The works of some of his pupils, Jacob Backer and Jurgen Ovens, indicate a move toward the Age of Elegance, noticeable in the rich satin and silk materials, whimsical subjects, and cheerful palettes. The Legacy of the Academy (1655 onward). Although Rembrandt lost his wife, possessions, home, and many patrons, he did retain faithful followers. His legacy was carried on through artists such as Arent de Gelder and captured in portraits such as the piece shown here by Daniel Koninck. Rembrandt’s work was admired by collectors over the next decades, but he had disappeared from the limelight. During the nineteenth century, his genius was widely recognized once again, and today, he is still considered one of the masters. The Master as Student. Although he was considered one of the greatest artists of the Dutch Golden Age, Rembrandt himself made a practice of studying the work of other artists. He visited them, collaborated with them, and collected their works. He was a student of those who came before him, and he stressed the importance (for himself and his students) of copying masterworks for the purpose of study – first in drawings and later in oil. Still today, artists study masterworks. When we visit museums and sit before great portraits or sketch from the masters in attempts to discern their processes, we follow in Rembrandt’s path and are doing just as he instructed, centuries ago. * Many thanks to Polk Museum of Art and Hoogsteder Museum Foundation for providing content and photographs of Rembrandt’s Academy, which is slated to return to the United States in 2019, “The Rembrandt Year,” marking his death 350 years ago.